With the fiscal deficit rising, analysts are expecting the government may levy a 1 per cent social spend oriented corporate tax surcharge or 1 per cent excise duty hike in the upcoming budget. 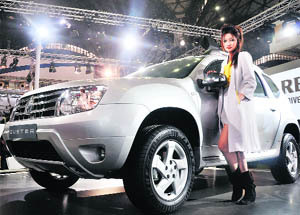 The world’s first hydrogen powered three-wheeler, the HyAlfa, was showcased at the 11th Auto Expo here on Monday. Part of a development project dubbed ‘DelHy 3w’, a fleet of 15 HyAlfa three-wheelers will run on an experimental basis at Pragati Maidan, where a hydrogen refuelling station has also been set up. After a rap from the aviation regulator for neglecting safety issues, Kingfisher Airlines on Monday submitted a detailed response to the DGCA giving time-bound plans to resolve the lapses and discrepancies identified. Satyam Computer Services on Monday said it had filed a suit against its former board of directors, certain employees and its audit firm PricewaterhouseCoopers, seeking damages for perpetrating fraud. The Sahara group on Monday assured the Supreme Court it had protected the interests of its 2.3 crore investors, who had put in Rs 17,400 crore, following which the apex court admitted its petition against the Securities Appellate Tribunal’s order under which it had to return the deposits. Acer on Sunday unveiled the world's thinnest laptop computer as an array of "ultrabook" rivals prepared to debut this week at the Consumer Electronics Show in Las Vegas, Nevada. Europe as a whole may avoid a recession this year and there were reasons to be more upbeat about prospects for the region, South Africa's Business Day newspaper quoted International Monetary Fund head Christine Lagarde as saying. Housing Development Finance Corp, India's largest mortgage lender, expects the RBI to cut the cash reserve ratio, rather than interest rates, at its monetary policy review on January 24, chief executive Keki Mistry said. Come September, and all social security pensions in Punjab will finally be disbursed through banks by making use of electronic benefit transfer (EBT). In order to meet this deadline, each district is now being allotted to one bank for initiating the disbursal of pensions through EBT. IT firm Patni Computer Systems today said it has received shareholders' approval for delisting the company from the Indian bourses and the New York Stock Exchange. In a regulatory filing, Patni Computer Systems said shareholders of the company have approved the delisting proposal with a "requisite majority". “Cooperate with us and we’ll cooperate with you,” West Bengal chief minister Mamata Banerjee told captains of industry at a meeting here on Monday. She assured them every investment proposal would be considered sympathetically and cleared within a fortnight’s time. There is also a possibility of a fuel price hike covering diesel, cooking gas and kerosene on budget day itself, according to a note by Bank of America Merrill Lynch. Bank of America Merrill Lynch expects the fiscal deficit to rise to 5.9% for fiscal 2012 as against the projected 4.6% by the government. The report says that Finance Minister Pranab Mukherjee is unlikely to present a draconian budget with rising global and domestic growth risks. A fiscal contraction of Rs 100 would reduce growth by Rs 150, the note points out. Still, Mukherjee is not likely to let the fiscal deficit careen out of control and therefore expectations of an across the board hike in taxes with the Uttar Pradesh polls advanced before the budget. The 1 per cent hike in excise duty could target consumer discretionary spending and could net Rs 100 billion. The hike in corporate taxes could also garner a similar figure if that option is chosen. Mukherjee may also hike fuel prices on budget day which could drive up March inflation to 8 per cent levels but would put out a major event risk out of the way. However, the analysts have factored in a 1 per cent hike in corporate tax surcharge or excise duty as a measure that could come in to control the fiscal deficit. The research note says it is unlikely that the government will be able to cut the fiscal deficit. It points out that slower growth would not only hurt revenues but also prevent reduction in expenditure. Besides, high oil prices and possible implementation of the Food security Bill would continue to nail subsidies at a high 2.5 per cent of GDP. The report has projected oil subsidies of 0.6% of GDP and is assuming a 10% hike in diesel, kerosene and cooking gas prices. There is a possibility of the government increasing administered fuel prices in July to play the base effect of last July’s diesel price hike. However, with the UP polls advanced to February, there is a risk Mukherjee may hike oil prices on budget day itself. India Trade Promotion Organization (ITPO) will use the vehicles on an experimental basis. The HyAlfa has been developed under a joint project by the UN Industrial Development Organization (UNIDO) International Centre for Hydrogen Energy Technologies, Mahindra & Mahindra and IIT, Delhi, with support from the ministry of new & renewable energy. “The aim of this project is to convert vehicles so that they can carry and use hydrogen — a carbon-free fuel — and thus remove all pollutants,” Mahindra & Mahindra president (automotive & farm equipment sectors) Pawan Goenka told reporters. He said the vehicle is not yet ready for commercial production and further fine-tuning will be required before moving in that direction. “Moreover, we also have to look at commercial viability of running a hydrogen-powered three-wheeler as the cost of hydrogen will be around Rs 250 per kg, which is not affordable at all,” he said. On an average, a CNG three-wheeler costs close to Rs 2 lakh. Commenting on the development, UNIDO-ICHET MD Mustafa Hatipoglu said the DelHy 3w projects aims to demonstrate hydrogen technologies developed by Indian partners for the Indian transport sector. 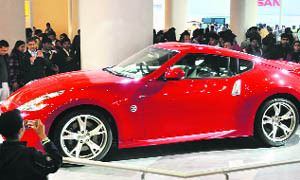 The project coordinator, IIT, Delhi Prof LM Das, said the HyAlfa marked a journey of 20 years from “laboratory to land“. As civil aviation minister Ajit Singh asserted that there would be no compromise on aviation safety, Kingfisher officials submitted the airline's response at the headquarters of the Directorate General of Civil Aviation here, but no details were available. A long list of discrepancies and violations by various airlines, including Kingfisher, had come to light in a financial audit carried out by the DGCA which directed them to resolve all issues in a time-bound manner. The DGCA asked the carriers to respond to the findings this week and take urgent action to rectify the situation. "The civil aviation ministry will not tolerate any violation of safety norms. There will be no compromise on air safety," Singh told reporters here. "Basically, you need more training for pilots and crew. All airlines have to do that. But this business has grown so fast in the last few years that some delays are taking place," he said. Pointing out the lapses and violations by Kingfisher, the financial surveillance report had said "a reasonable case exists for withdrawal of their airline operator permit as their financial stress is likely to impinge on safety." It had also come down heavily on Air India Express, saying "a prima facie case exists for restricting their operations in view of safety issues." Among various issues, Kingfisher was asked to submit a plan on recovery of its flights and recapitalization of the airline by today. The airline has cancelled 157 flights in this winter out of a total of over 400 allotted to it. Kingfisher CEO Sanjay Aggarwal had earlier said the DGCA had carried out two safety audits of Kingfisher in the past three months and there were "no significant findings". 20 of the 64-aircraft fleet of the Vijay Mallya-owned airline are grounded for a "multitude of reasons", including want of engines, spares or reconfiguration of seats, he added. A bench headed by chief justice SH Kapadia also extended its stay on the Securities Appellate Tribunal order and fixed the next hearing for January 20. At the last hearing, the Supreme Court had directed the group to submit the balance sheets of the two of its companies – Sahara India Real Estate Corp (now known as Sahara Commodity Services Corp Ltd) and Sahara Housing Investment Corp — which had collected the funds from the investors through optionally fully convertible debentures. The regulator had also restrained the two firms from accessing the securities market for raising funds, pending return of the deposits. "The eurozone scene has changed massively over the last 18 months or so ... there are reasons to be a little bit more upbeat about the prospects," she told the daily in an interview published on Monday after a visit to South Africa last week. "Our assessment is that even if some of the euro-zone countries are in a recession technically for some or all of 2012, the whole of the zone might not technically be in a recession," Lagarde said. "You've got very different economies cruising at different growth rates. That is going to have an impact on the entire eurozone and might avoid recession for the eurozone at large." However, the euro zone crisis could hurt South Africa's economy, Lagarde said on Saturday. She urged Africa's economic powerhouse to maintain supportive monetary policy to ensure growth in the medium term. Meanwhile, German and French leaders will meet on Monday to discuss ways to boost growth in eurozone states struggling to overcome the sovereign debt crisis and rising unemployment, and finalise a deal to increase fiscal coordination within the currency union. They may also discuss a financial transaction tax, the "Tobin tax", being promoted by France but resisted by Britain unless adopted on a global scale, which could split the European Union at a summit at the end of the month. The Reserve Bank of India has raised interest rates 13 times since March 2010 by a total of 375 basis points in its bid to control headline inflation that has been steadfast above 9 percent for a year. However, a rapid slowdown in food inflation in December has raised hopes of a reversal in its monetary tightening cycle. It is learnt each bank has been asked to cover seven blocks in the district allotted to them for opening accounts of these pensioners. As a pilot project, the banks have already successfully credited funds to the accounts of 12,000 pensioners in Mansa and Samrala. Now pensioners across the state will be issued smart cards under EBT and, by using these cards with biometrics, they can get their social security pensions from the bank directly. The implementation of EBT for government schemes will ensure redressal of all complaints regarding poorly managed disbursal of these pensions by panchayats. As of now, panchayats disburse the old age, widow, disabled and dependent pensions given by the central government, and the old age pension given by the state government. Through the present system of disbursal, state is losing money in these social security schemes as a number of dead and fictitious pensioners are found to be availing these benefits. About Rs 564 crore is disbursed every year to 1.85 million beneficiaries in Punjab as social security pension. Efforts are also on to link the smart cards issued under electronic benefit transfer with the Unique Identification (UID)number by the UID Authority of India. According to the delisting proposal, equity shares of Patni would be delisted from the BSE as well as the NSE and its ADRs would be delisted from the NYSE. Banerjee was inaugurating the six-day ‘Bengal Leads’ industrial summit where several prominent industrialists of the country were present. She told them there would be no hassles in buying land for setting up their plants if they were “serious” about investing in Bengal. She alleged “some vested interests” had been spreading “canards” against her government and discouraging new investments in the state.